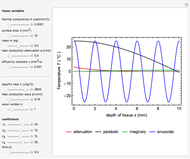 This Demonstration is about time-varying heat conduction in biological tissue. 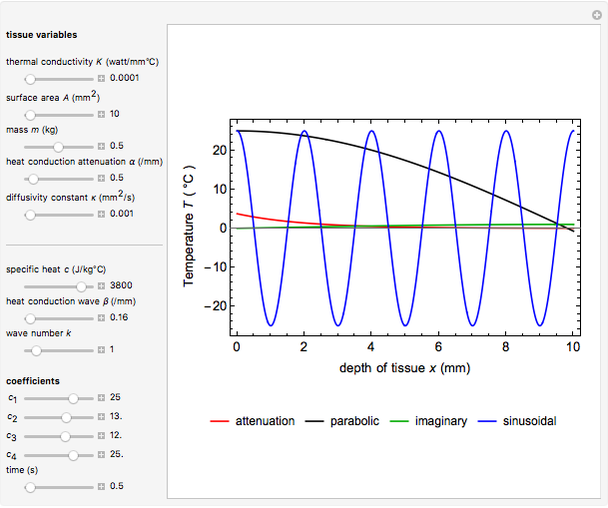 The main objective of a conduction analysis is to determine temperature distribution in a tissue medium, that is, to know the temperature in the tissue as a function of space at the steady state and as a function of time during the transient state. Once this temperature distribution is known, the heat flux at any point within or on the surface the tissue may be computed from Fourier's law. 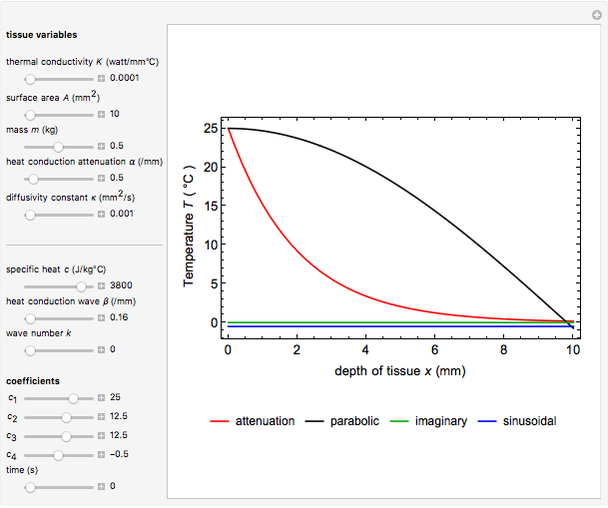 A knowledge of the temperature distribution within a tissue can be used in medical applications via a determination of the thermal stresses and distortion. The optimization of the thickness of a tissue can be studied by knowing the temperature distribution and the appropriate heat transfer characteristics, which indicate the appropriate temperature distribution at every point within the tissue categorized into the quasi-conductor medium at . Snapshot 1: Parabolic equations typically describe propagation problems. Time usually appears only in a first derivative, and the process involves only the forward direction of . The graph shows that type of the parabolic solution set with a value of heat conduction wave constant for the complex exponential solution (the maximum real part is in black and the minimum imaginary part is in green; see legend). On the other hand, the attenuation solution of the thermal gradient equation (red) is adjusted at a value of heat conduction attenuation constant in tumor tissue. There is also the heat conduction wave sinusoidal solution form (blue) but no parabolic solution type. The initial condition prescribes the unknown function throughout the given region at some initial time , in this case . Mathematically speaking, the time and the space coordinates are regarded as independent variables. In this respect, the initial condition is merely a point prescribed on the axis and the boundary conditions are prescribed in this case as two points on the axis. Initial conditions are usually prescribed at a variable time or , but time dependence need not be considered. Snapshot 2: Unlike the parabolic solution (black and red), the heat conduction wave solution (blue) does not decay with depth and time . Instead, there are standing waves set up between the two sides of the medium boundary. With amplitude constant , the fundamental standing mode ( ) oscillates with a frequency and with the standing mode. An interesting interpretation of the graph shows that intersections of heat conduction wave propagation (blue) and parabolic heat conduction distribution (black and red) describe information from the tumor tissue temperature at discrete points only for heat propagation. It can be seen that temperature reduces the attenuation for the solution of the temperature gradient equation (red). Snapshot 3: For the solution of temperature gradient equation at an internal line of symmetry, we need two boundary conditions in the direction and one time condition. Boundary conditions are, as the name implies, frequently specified along the physical extremities of the tissue body; they can, however, also be internal—for example, a known temperature gradient at an internal line of symmetry. The time condition is usually the known initial temperature. As time increases from to , the temperature reduces with increasing depth of tissue (red). This means that the temperature of the complex exponential (black) and sinusoidal (blue) solution is independent of time. The main mechanism for heat flow inside a tissue is through conduction, meaning that the gradient in the temperature within the tissue itself drives the flow. Snapshot 4: Heat conduction equation parabolic solution in the complex exponential form (black) can be set to be the same as the heat conduction wave pattern (blue) with its value of heat conduction wave and each amplitude constant . Meanwhile, the solution of the temperature gradient equation reduces toward zero at (red). The partial differential equation of heat conduction in tissue medium with the boundary conditions tell us what is happening at the boundaries to affect the solution inside the domain of interest, whereas the initial conditions tell us the state from which the solution evolves. Without it, the mathematical specification of the problem is incomplete. Physically, we understand that two identical quasi-conductor media (e.g. biological tissues) with the same boundary conditions may evolve differently if they start with different initial temperatures. In this interpretation, the above solutions depend on the heat conduction main parameters such as a tissue heat conduction attenuation, heat conduction wave, and thermal diffusivity. 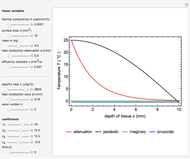 To better understand the heat conduction in tissue physical interpretation using the heat conduction equation, we need to look more in detail on the thermal properties of tissue. For physical problems, it is not sufficient to know that the problem exists and has a unique solution. Hence the continuity requirement is not only useful but also essential. If the solution is to have physical significance, a small change in the initial data must produce a small change in the solution. The data in a physical problem is normally obtained from an experiment, and is approximated in order to solve the problem by numerical or approximate methods. It is essential to know that the process of making an approximation to the data produces only a small change in the solution. H. Ilham, Introduction to Biophysics, 1st ed., Pekanbaru, Riau, Indonesia: RUEDC-Press, 2007. A. Tveito and R. Winther, Introduction to Partial Differential Equations: A Computational Approach, New York: Springer-Verlag, 1998. Muhamad Hamdi and Yusof Munajat "1D Heat Conduction through Biological Tissue"